As a resource modeling mining consultant, I tend to get my hands on a lot of data. This data typically consists of model-specific files such as drilling data, lithology boundaries, topo maps, etc. It will also typically include many old reports and memos pertaining to prior resource models, which may be stand-alone files or simply emailed instructions and information. It can become fairly overwhelming to keep track of all of this information, particularly in the relatively short amount of time I have to receive, make sense of, and process the data for a reasonable resource model. I also have a tendency to make notes for everything, as I’ve found through the years that I forget exactly what I did for a model – particular settings in a panel, filters on composites, and problems encountered while making resource models. If I don’t keep extensive notes as I work through the models, I’ll spend an inordinate amount of time trying to back-track my progress. I first stumbled upon Evernote nearly 5 years ago and it has proven priceless for my productivity (and sanity!) ever since. Evernote is basically a note-taking application on steroids, in which information can be typed, hand-written, spoken, scanned, or pasted into each note. It has applications for Windows and Mac OSX as well as mobile apps for Android and iOS, and also has a web interface so notes can be accessed from any computer at any time. Without going into great detail concerning the basics of Evernote (those can be found on their website) I am going to share my general workflow along with some of the tips and tricks I’ve picked up through the years for making the most of my Evernote notebooks for my consulting projects. A typical layout I would use for notebooks and sub-notebooks within a given project. Each client gets a main notebook, then the projects have notebooks for my notes, data and emails, and a sync notebook to pull files into Evernote automatically. The next three sections detail the typical uses I have found that work best using this sub-notebook layout. The first sub-notebook is delegated to all of my notes. In addition to typical generated notes regarding the progress of a model or project, I have found it particularly useful to store working files in Evernote to both keep track of the files (instead of burying them in some folder on my PC where I’ll be lucky to find them again) as well as to keep track of the genesis of a final product – instead of renaming files with “edit 1”, “edit 2”, and so on, I can keep the name of the file as-is and simply have it saved to different notes on different days (or the same note at different times of the day if modfiications are that frequent) to keep track of exactly what was changed from iteration to iteration. For example, I use Vulcan software for resource modeling, which generates most resource model files (block model frameworks, estimation files, etc.) externally to the program. As such, if I want to test an estimation, modify it, and run it again, I can keep the first estimation parameters file in Evernote, make the changes to the working file within Vulcan, and save that file again to Evernote, giving me two versions of the same file with a timestamp to differentiate the runs (as well as notes pertaining to each run and the modifications therein.) In this manner I can also keep my working Vulcan directory clean – instead of having 20 files that are just iterations of the first, I only have one file of which to keep track. Evernote also comes equipped with a built-in screen capturing tool similar to SnagIt. It will work within Evernote by making a new note for each screenshot, or it can make external .png file of the screenshot just as SnagIt would produce. Likewise, it can save a screenshot to the clipboard to be pasted in another file (such as a Word or Powerpoint file) or into an Evernote note. I use this function quite a bit to make in-line screenshots – as they say, a picture is worth 1000 words, so if I can describe what I’m seeing in Vulcan and then paste a screenshot directly below the description, I can remember exactly to what I was referring and will have no question later. Tags are a particularly useful way to quickly filter notes by general aspects that may cross over different notebooks. My primary use of tags is keeping track of work within a billing cycle – for the most part I bill at the end of a given month, so I like to tag all of the notes from a month according to the month and year. Yes, I could get the same effect by filtering by date, but it’s quicker (in my opinion) to use the tags. 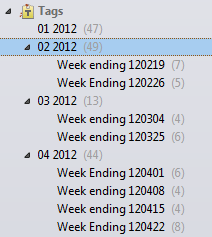 Likewise, one client requires weekly timesheets, so I have additional tags to break down by week for that client. At the end of a year, I will combine all tags for the previous year into an overall tag by year – so all of my notes from last year are still broken down by month, week (in some cases,) and are under the 2011 tag as well. Tags for the month the work was performed. For each month I have tags for weekly breakdown where necessary. The 120905 being the date in YYMMDD format, Example Project being the project I’m working on, 5 hours was the time spent* (which obviously needs to be updated at the end of the day) and a simple note describing what the bulk of the note/day’s work entails. *Another tip – while Evernote doesn’t have a built-in Project Timer (which would be nice!) I like to use Timecatcher for Android, which I’ve reported on previously. Definitely useful for tracking time spent on projects, and I will use Timecatcher and Evernote together at the end of the month to make sure I’ve not mis-calculated my time spent on a project – a good double-check. All too often I will get trickles of data for days or weeks after the initial project kick-off session as the client will find additional material on their computer or elsewhere that I will need, or items that I request after the fact. Other times I’ll need to ask a question about an aspect of the project and will receive an email response days or weeks later. When this happens, I have the Received Emails and Miscellaneous Data notebook to catch this information. I have found Outlook to be less functional when running searches than Evernote, so it’s more favorable to put emails into Evernote and remove them from Outlook. It helps keep my inbox clean, and makes searching much more efficient. There are two tricks to getting an email into Evernote. The first is to install the Outlook plug-in (if you’re using Outlook, of course.) It’s a handy button under the Home tab to automatically move a note to Evernote. The Evernote Button as seen in Outlook. Automatically move emails to Evernote using this handy tool. Upon clicking the button, the selected email in Outlook will be queued to be added to Evernote, and a second panel will open for additional input. Tags can be added at this time, as well as a specific notebook for the email to be added. Once clicking the Evernote button in Outlook, additional options for handling the note are available in a pop-up window. Click on “Add Note” and the note will be found in the specified notebook upon the next synchronization. A second method for adding emails to Evernote is to simply email them to yourself. Upon signing up for an Evernote account, every user is assigned an email address for their notebook. REMEMBER THIS EMAIL, and make a contact for it in your email client of choice, as you’ll likely use it a lot. As a new important email is received, simply forward it to the Evernote email and it will show up in your General notebook. If you add @ and the notebook name to the Subject line (without parentheses), it will put the email into the notebook specified. 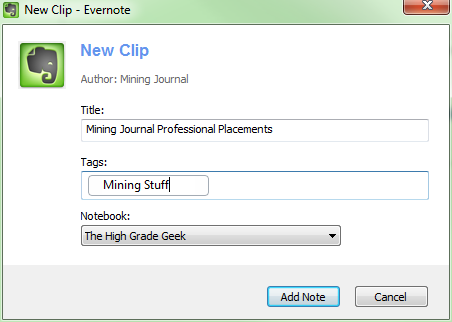 So, if I wanted a note with subject “Important Mining Stuff” to go to the “The High Grade Geek” notebook as shown in the screenshot above, I would change the subject line to read “Important Mining Stuff @The High Grade Geek” and it would save the note to the The High Grade Geek notebook. Pretty simple! This is a really neat feature of Evernote that I’ve only started using recently. The way it works is to set up a folder on your PC into which “synced” data will be placed – I’ll put it in the same parent folder where I’ll set up a Vulcan working folder, Leapfrog project folder, etc., calling it “Evernote Transfer” or “Evernote Sync”, something to differentiate it from the working folders. In Evernote select the Tools > Import Folders option and click the Add…button. Browse to the Sync folder and select it. In my case I typically won’t use sub-folders, though that’s obviously a personal preference. I’ll also select the option to delete the file from the Sync folder so I don’t get multiple copies of files strewn about my computer AND Evernote – that sort of defeats the purpose! Once the link is set up, you can move files to the Sync folder and Evernote will automatically pull them into new notes – this can be particularly useful with report files such as Grade/Tonne reports generated during a resource estimation run. By selecting the Delete Files from Folder option, I am guaranteed to not have a folder full of redundant files – everything I want will be in Evernote. Right-click on the file to be hyperlinked and pick “Create Shortcut” – this will make a shortcut with the same name as the file in question in the same directory. Copy EVERYTHING from the “Target” textbox – it will likely be C:\…\file type format. Click on the hyperlinked text to make sure the file opens correctly. A really cool aspect of hyperlinks in Evernote is the ability to hyperlink to notes themselves – I will often hyperlink to a previous note that pertained to what I’m working on, or perhaps a “tips and tricks” note that I’d made when having to troubleshoot a similar problem previously, or to a note in the “Emails and Miscellaneous Data” sub-notebook that pertains to my current task. To hyperlink to an Evernote note, either right-click on the note’s name in the note list and pick “Copy Note Location”, or go to Note “Copy Note Location” when the note is open or selected. Then create the hyperlink and paste as in step 4 above in the new note. Clients will very often want to know day-to-day progress on a project. Instead of re-annotating everything I’ve done for a day in a summary email to the client, wouldn’t it be smarter to simply let them see my daily notes? Evernote allows me to share individual notebooks with clients such that they can see my notes but not modify them (unless I allow the client to do so) via the web interface. Simply by selecting “Share Notebook” from the notebook list, the notebook in question can be shared with any email address necessary. Share a notebook with a client, colleague, whomever you’d like. Notebooks can even be shared publicly, though be very careful with sharing confidential information! In addition to sharing with clients, multiple collaborators on a project could use a shared notebook (with modification permissions allowed) to have a single notebook for an entire project that all members of the project could see and update. This would be a simpler (and in my opinion more effective) solution to something like Sharepoint, and likely significantly less expensive. I’ve been using Evernote for a long time, and these are tricks I’ve come up with along the way to help make sense of the volumes of data and information I have to deal with on a daily basis. Hopefully they are of some use to new Evernote afficionados. However, the best advice I can give is to simply use Evernote! Come up with ideas that help you and report back here, I’d love to know new and better ways to keep track of my projects. Evernote can be found here in free and paid flavors.